Cheats One Piece Treasure Cruise Android and iPhone - The new game One Piece Treasure Cruise is beginning to depopulate between users iOS (iPhone and iPad) and Android despite being released only a week. We have collected for you the things that you absolutely have to know to better face the game, the tricks to pick up faster your characters and other tips of this type. If you have others do not hesitate to write them in the comments and we will add them to the list promptly. 1- Enhance the main characters of One Piece pirates sacrificing more feeble. Enhanced when a character, in the slot under the upgrade you can also enter the other characters. Sacrificing pirates in a star example is a good idea to grow quickly the characters on which bets! 2 - Try to catch as many gems as possible while the game download updates. During downloading updates will be present to entertain the game "rainbow of gems." You have to be really good at very quickly press your finger on the screen to create as many touches as possible and get as many gems as possible. 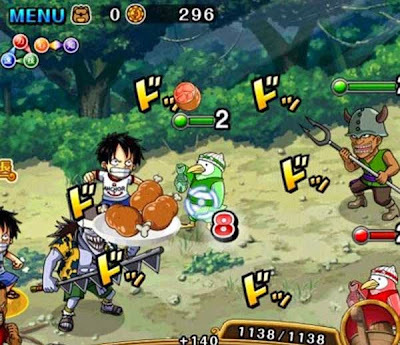 3- When you see appear a potentially shaped piece of meat close to one of your characters in One Piece Treasure Cruise, put it immediately in the attack. At this point you should be able to carry out an attack "good" or "very good" to allow the character to recover the same Hp (energy). If you will make a perfect attack, the meat will fly away! 4- Power your ship. Not only pirates, but also the ships may be intensified. If you are careful to descend the right booster many of potentially will go directly to the team and will increase the performance of your team.